Last week, I talked about some of the struggles and breakthroughs we’ve had as a team in defining a creative direction for Colette. Today, I wanted to share more specifics of how our process has changed and evolved as we’ve grown, and the methods we’ve been using to bring more focus and clarity to the things we create. I think you might even find it relevant to your own sewing practice. It definitely helped us in developing our upcoming pattern (coming September 6 – don’t forget to sign up to become a pattern insider for more details). Today, I’m going to tell you about how we went about learning about our customers and turned that into an overall creative direction. In part 2, I’ll talk about how we used this process to design, showing you the process for our upcoming pattern. Design was simple when Colette was a one woman operation. I found inspiration, thought about what I personally wanted to sew, did some sketching, and started drafting. Not perfect or super strategic, but simple, quick, direct. As the team grew, this process changed organically with time. Now, other people were reinterpreting the core ideas about what Colette was, adding their own perspectives and influences and desires. This infusion of new ideas was great, but in the end things started to become fractured and a little muddy. Ideas would be interpreted and reinterpreted to create something that, in the end, didn’t quite meet anyone’s original plan. 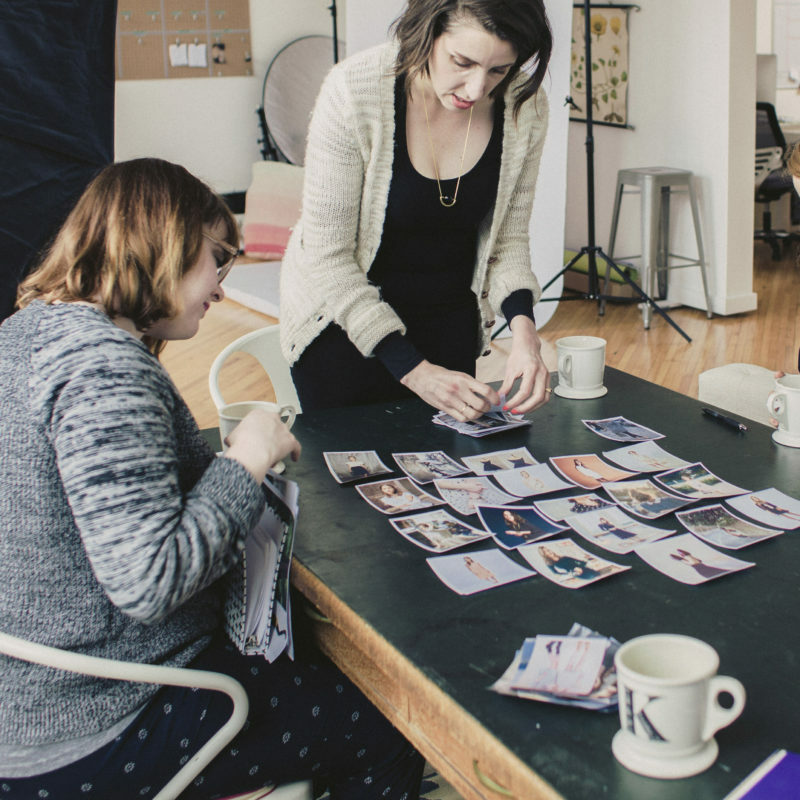 We’re a collaborative bunch, and we genuinely love building ideas together. But we realized we needed stronger vision up front, something clear and meaningful that each person could understand and then contribute to, whether it’s Anna creating the technical designs or Taylor bringing the idea to life in a photo shoot. Over the last six months, I think we’ve greatly improved our creative process and how we collaborate on it as a team. Here’s what we do now. The first step was to take a step back from the nitty gritty of what we are creating, and to look at who we’re creating it for. I started by creating an overarching vision for the next 12-18 months. The first thing I wanted to do was get a picture of you guys, our customers. You are the makers, the ones interpreting the patterns and fitting them to your own personal style. You have to come first. The process for this was long and pretty involved. We did a lot of research, including a large-scale survey with over 6,000 participants. Among lots of other questions, we asked our customers to describe their own personal style with a few keywords. Some words definitely came forward more than others. But one thing we’d noticed from seeing what you guys make, your blogs, and talking to you on social media is that there isn’t just one set style. There are different looks, different values, different priorities in what you make and wear. Let me get super nerdy for a second. My background is in research, and I’ve always thought that the best way to understand big groups of people is a combination of quantitative and qualitative research. That means looking at numbers to understand patterns, then looking at individuals to understand their stories. From our 6,000+ responses, I did some complicated math called a cluster analysis. The short version is that this grouped similar people together to come up with a few clear types of styles that our customers gravitate towards. We ended up with three main style groups. Now, the fun part. I selected a bunch of real people from each group and took a look at their Pinterest accounts (which they shared in the survey) to actually visualize what these styles meant to people. I used these to create moodboards for each style. Now we could all answer the question: what do people really have in mind when they use a vague word like “classic” to describe their style? Does that mean lots of neutral colors? Does it mean vintage-inspired shapes? Is it Eileen Fisher? Kate Spade? Next, we decided which of these three groups made more sense to cover with Seamwork patterns, and which for Colette. We also took into account many conversations with indie shop owners about what they saw, which was very helpful. Finally, we created a customer persona for each product line, who I thought epitomized the style, goals, and life of our customers. For each one, I also created a moodboard for the next year. Here’s the moodboard for Colette in 2017, to give you an idea of the overall feeling (not necessarily the designs though). And here’s one for Seamwork. I think you can clearly see the differences in style, but also how they can overlap and play together, depending on the context. So this is how we created a long term plan for what we wanted to go for. The next step would be to use this information to design some patterns! In part 2, I’ll show you how we designed our new upcoming pattern. Stay tuned for that on September 9th after the pattern is released! 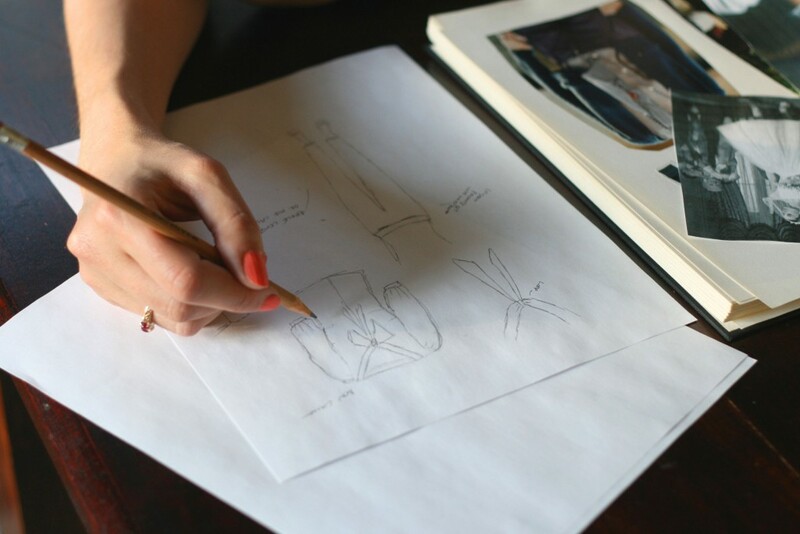 Get the scoop – become a pattern insider! If you’re interested in seeing more of what we’ve got in the works and being the first to pre-order our fancy new pattern when it launches on September 6, you should definitely sign up to become a pattern insider. This is a totally new thing we’re trying out! We’ll be sending out some exclusive looks at what’s coming, you’ll get to see and buy our patterns before anyone else, and you’ll even get discounts that aren’t available to anyone else. This process is fascinating, Sarai. Thank you for sharing it and giving us a glimpse of Colette’s inner workings, as well as what user experience is all about. 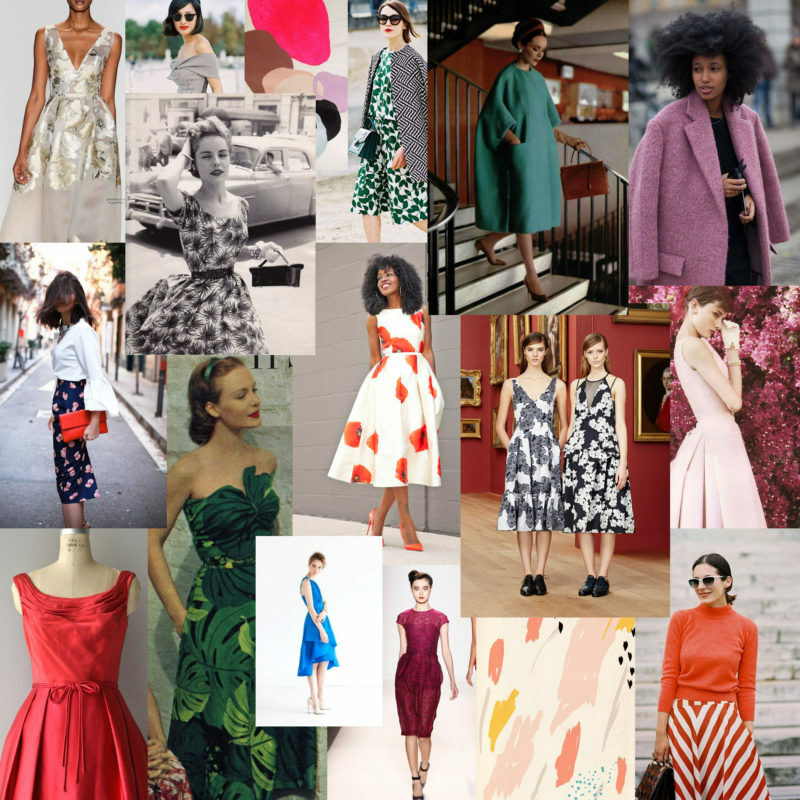 I’m totally feeling myself drawn to the Seamwork moodboard. Thanks for sharing the process, sewing is such a process-centered activity so that only focusing on the final result (for me the garment for you the pattern) makes very little sense. Also I’m much more likely to buy a pattern from a company I feel I know rather than a company I don’t. I want to know who made my patterns! Really interesting to read about your process and how in depth you’ve gone with your research. Based on your moodboards can’t wait to see what you release over the next year! You can definitely see the differences in direction for Colette and Seamwork. I tend to gravitate more to the Colette side when it comes to excitement over patterns, but I still LOVE and look forward to reading Seamwork on the first and will continue my subscription evendors if I may never make a Seamwork Pattern. Thank you for sharing the process and I really cannot wait to see the newest pattern!!!! It’s so fascinating to see inside the process of designing and making patterns, thank you for sharing. I’m really excited to see what’s coming for Colette in the rest of 2016 and onwards into 2017! Thank you Sarai for sharing Colette creative process, it is really interesting to me. I love Colette patterns because I like vintage dresses especially from 40ies and 50ies, but for me it is easier to sew and wear (in the office most of the time) Seamwork patterns. 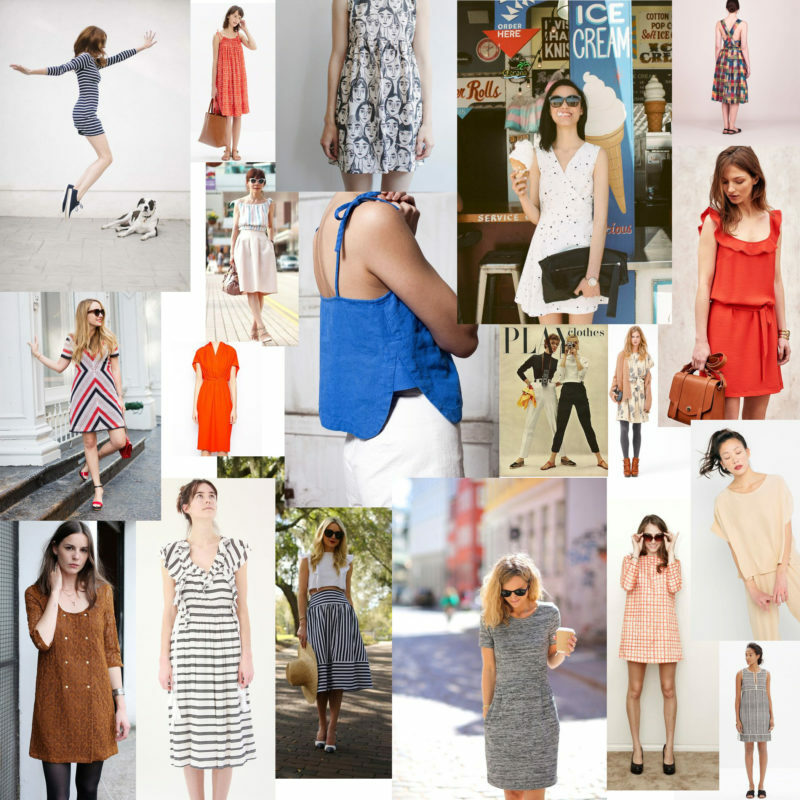 By the way the Seamwork moodboard is simply beautiful. Hey, could you actually elaborate more on the cluster analysis, and/or maybe give examples of how the survey answers clustered around certain themes? I’m extremely curious about how this part of the process is done. Thanks for sharing the process. :( don’t find myself represented, only stylishly shaped much much youngers. Do you know who’s designing with older beauty in mind? Fascinating! I’ve followed Colette from the beginning…its like watching the neighbourhood kids grow up, lol. Love the details of your data analysis. Sharing the developmental process of your business is useful on many levels. I’m eager to follow the next chapters. I think I’d place myself somewhere between both mood boards. On the one hand, I love the Colette moodboard above and I’d also be interested to sew some more challenging projects, like you mentioned in the post on your next patterns. On the other hand, most of the regarding garments seam very 50s and glamorous so I’m afraid that might be a little too much for me/not suite my style. But anyway, I understand that both are just moodboards ;-) So I’m really curious how the upcoming patterns will be. Describing a creative process is so difficult especially from a group perspective. I really enjoyed this post because I think creativity is such a critical enlivening part of life but it’s certainly central to why people sew :) I’ve worked on research teams in the past combining both qualitative and quantitative methodologies and I agree they produce the most reliable results. It’s heartening to read how you return again and again to what your customers want as the centre of your wheel. What struck me about the difference in your mood boards – Colette versus Seamwork – was the age of the models. I think that must be the most complex challenge for Colette – you don’t really specialize in an age bracket which other Indie companies do. I can’t wait to see your latest addition on Sept 9th! I really enjoyed reading this and comparing the two boards. I have recently lost a great deal of weight and am still losing, none of my toiles fit! For this reason at this stage I will buy Seamworks but just love what is on the Colette board those styles are gorgeous. Thanks for giving us a look behind the scenes! I love that you include some quantitative analysis in your creative process. Like Ariel, I would really enjoy reading more about the clusters you identified. What were the 3 main style groups? Funny. After you explained the process I can clearly see I’m more a Seamwork than Colette sewist. Thank you for sharing. Looking forward to the next segment. Also loved seeing all the stripes on the seamwork’s mood board! What a fascinating look into your creative process… and I love the lines, colors, textures and feeling in both mood boards. I have been drawn more to the Seamwork patterns so far but I’m excited about the direction you are taking with the Colette patterns! I don’t agree that Seamwork is too basic – in fact, I feel like that board better represents my style. Those boxy tops are giving me LIFE! This is GREAT. Honestly, it feels like you guys lost yourselves for a little while! Glad to see this new focus. I have to say though. The Colette patterns seem to be targeting an older audience? Maybe I’m confusing age with maturity and complicatedness of designs, but I don’t see 20-somethings wearing the Colette patterns. I disagree with others that simple patterns (ie style lines) are not interesting or complex to execute perfectly. I was a judge at the MD State Fashion Revue just last week and we awarded the champion to a simple A line skirt and kimono style jacket over a satin evening dress with cutouts and 20 plus pieces. The first was executed flawlessly, the second, not so much.